Great job! I'm so glad we did this and I'm glad we both finished! Good for us! Heather - Thank you. Yes, I am very proud of both of us. We did do a great job if I have to say so myself. Congratulations and enjoy your rest! Brianna - Thank you. Congratulations to you as well. I look forward to having you back regularly and be assured that I will visit you regularly as well. It is so weird having to fall back into my old blogging routine. Congrats on finishing, I developed a laptop virus partway through so I cheated a couple of letters. Glad to follow you, that is when you get back. I had a blast with A-Z! phew- its over and regular stuff takes over again. Wanton Redhead Writing - Thank you so much for following my blog. The most important part is that you participated. It is great meeting you. Summer - So very true. I am finding it weird to get back into the swing of normal blogging. So glad to see the Z-end of it! 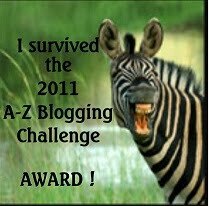 I'm still trying to make it to all the blogs that participated in A to Z. Just think how exciting it will be next year with even more blogs to visit. Patricia - I shamefully have to admit that I did not make it to all the blogs. I was too busy replying and keeping up with my new followers. Thank you for stopping by and for following my blog.